So I’ve become obsessed with wristwatches lately. It’s been going on for the past few months. Like the wine obsession from a couple years ago, I am immersing myself in the minutiae of the hobby. Everything from knowing the history of some brand name that goes back to the 1800s to model numbers of current product lines. Comparing it to the wine obsession, I think I am attracted to complication and order. When I was reading about wine, the trivia that stuck in my head and that was most enjoyable to read, were all the weird ways they organized the European appellations. The “New World” stuff seemed too chaotic to remember. My path to the Horological world started with looking at all the different “Men’s Accessories”, cufflinks, watches, lighters, etc. Watches have complication and order to them though, and I got hooked. Unfortunately, I found I prefer the spring and gear driven mechanical type of watch as opposed to the electronic, battery powered quartz watch. This is unfortunate because the cost of mechanicals can get pretty insane. Since then, I’ve purchased 2 “inexpensive” mechanical watches I.E. < $500. And one “middle tier” watch which I got a great deal on. 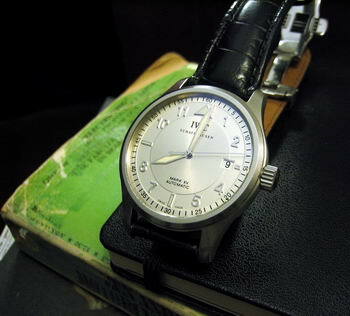 IWC is a classic company that goes way back and I was just amazed at the deal I got. I would put IWC at about the same level as Rolex, when it comes to price range. Not to mention it is a great looking watch! I finally got the tripod out and took a decent macro photo. Although, because of the demand and name recognition, Rolex will hold closer to the retail price after purchase. I used to think Rolex was supposed to be the best you could get, but I never liked how they looked at all. Now I know there are brands out there that put Rolex to shame in price and quality. Crazy! My wine obsession did last quite a long time, so I’m worried about the kind of money I’m going to sink into this one. Also, around the time of my poker and wine phases, they were somewhat mainstream. We'll see if wristwatches also follow that trend.